Welcome to the "Embellish Me With Quilling" Blog Hop...If you just came from visiting Carol at happyexpressions you are on the right track... if not you can begin HERE with Linda at krazyquilling. I'm a self taught quiller, having discovered quilling almost 7 years ago and absolutely love it. 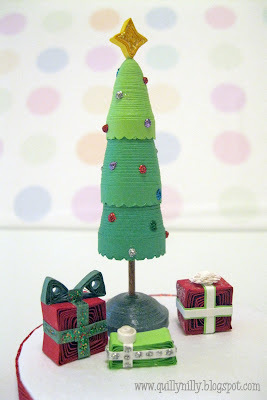 For the blog hop I created a super cute 3D miniature Christmas tree with presents. I've just recently started experimenting with miniatures and I love the challenge of trying to create a little sculpture out of paper. 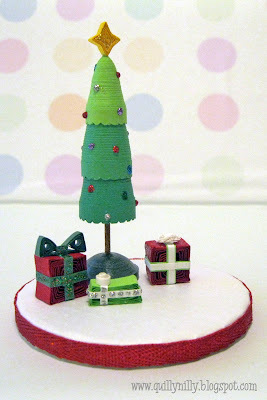 One lucky person is going to win this fabulous quilled Christmas miniature . Become a follower of my blog, for one chance. For an extra chance, become a fan of Quilly Nilly on facebook. Leave a comment here letting me know (don't forget to leave your email address) and I will pick a winner Monday morning December 20th. Next stop on the blog hop is the very talented Debbie. Take care. Wow you are very good at quilling!!! Love the earings!! TFS!!! Wow how awesome! Those earrings are just so cute. And the presents & Christmas lights all of them are great. I'm a new follower come and visit me. Great tree - very inspiring and different! Wow I love the tree, I am now a follower. Wow. That tree and the little presents are simply adorable!!! Very beautiful skill to learn. You have inspired me to look further in to it. TFS and a chance to win. ADORABLE....are us blog hoppers aloud to enter your blog candy too? Even though you are new to 3d quilling your ideas are fantastic and inspirational. this hop turned out to be a lot of fun and I would do it again. Open to all Blog Hoppers. Good Luck! Your tree is so cute. It would look great next to my moose :) Thanks for being in the quilling blog hop. I always enjoy seeing your projects. I am a follower since long and also a facebook follower :) Absolutely adore the artifact...beautiful and perfect ! This hop has really opened my eyes to quilling! I've just become one of your followers. I scrolled thru your older posts- you do beautiful work & I look forward to seeing more! OMG I love this tree I would love to see a video on how to do this. Oh my, T\tese are just beautiful. Such talent you have! The 3d Quilling is amazing. Love your project. TFS. Just became a follower. 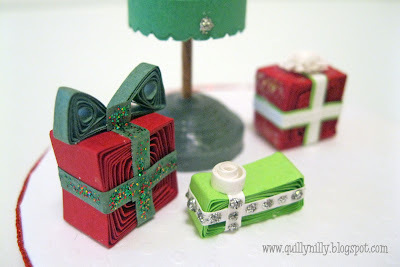 Your tree and present quilling is so darn adorable. Thanks for the blog hop. Very nice!! Love the tree!! Absolutely breathtaking. Wonderful. I am now a follower. I am now a fan (like) on Facebook for my second chance to win this awesome prize. I am a new follower on your blog!! You are very talented, your tree & presents are just to adorable!! I hope I'm the lucky winner, I love minatures!! I also liked you on your FB page!! Merry Christmas!! OMGosh!! I am brand new to Quilling and teaching my self. I have never seen Quilling like this. It is amazing. TFS! I'm a follower, as well as a fan on facebook. Pretty. I loved quilled things. Those presents are so cute and so is your little Christmas scene! 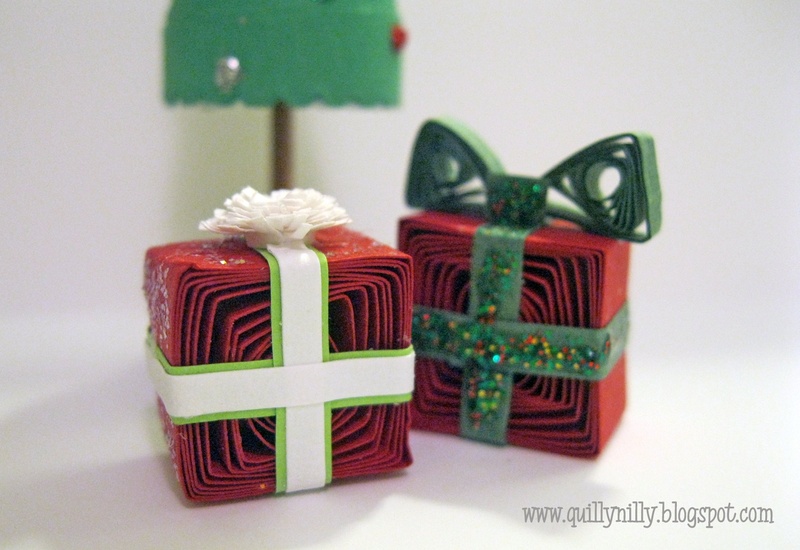 omg i love the xmas tree with the presents.. so cute.. im a new follower..
Super cute Christmas mini! I became a follower. I am amazed at what you can do with quiling. Love the Christmas Tree and gifts. Would love to win them. I already have been inspired enough to know that I will try quilling (it looks like so much fun and adds such a special, dimensional touch to cards & paper crafts), but your Etsy shop blew me away!!!!!!!!!!!!!! Your creations are AMAZING!!! :) And I love your Christmas scene sculpture!